SAGE India Digest: What really goes into creating a Successful Drama and in bringing out what it intends to! What really goes into creating a Successful Drama and in bringing out what it intends to! Have you ever gone to a movie that had famous actors and a great director, but the movie was not good? Many believe the magic is in the script. If the characters aren’t developed well, if the story lags or doesn’t keep your interest, then even million dollar stars can’t make it work. Writing and Producing for Television and Film, is an art which go hand in hand. To communicate your idea properly you need to have a well written script to which your target audience can connect. Whether you write a story or a screenplay, it’s always advisable to work out the plot ahead of time so you can discover the best way of telling it to not only appease the reader, but also to engage your audience. 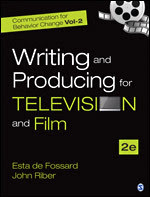 A book recently published by SAGE, “Communication for Behavior Change- Writing and Producing for Television and Film” covers all the aspects of creating a television drama from creating strong script, character development, presentation, pre-production needs, budgets, and contracts to guidelines for Successful Shooting. Moreover, in a chapter on “Guidelines For Pre-Production” authors have discussed the various challenges and issues they face before every day shoot such as the exact locations where the film will be shot and the cost of location hiring, the schedule for the shooting crew and actors on each location, transport needed for all personnel to and from the locations and catering needs for all personnel during shooting accommodation, where necessary, at distant locations. The book clearly demonstrates that creating a successful drama requires a lot of homework and brainstorming to bring out what it really intends to. It is very much similar to the case as a contractor can’t build an office building without being able to understand the architect's blueprints. To read more on Drama and Film making grab your copy now!